Below are photos and maps for our office and various courthouses and Social Security hearing offices. Click for a map to our office. Free parking is available at the front of our office building and free covered parking is available at the rear. Handicap parking is also available at the rear of the building. 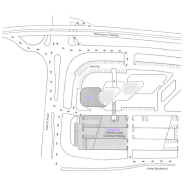 Click on the image at left for a detailed view of our office access and parking areas.